National youth volunteers service V wanted to create a channel through which young people could express their views and have them heard by the people in power. The result was Voicebox, a project which aims to curate the views of 16-25s and visualize the results in creative ways. Each month, young people are quizzed on different topics including how they spend their time, what they care about, how many carry knives and what they really think about the area they live in. At the centre of the campaign is the Voicebot, a robot which writes. 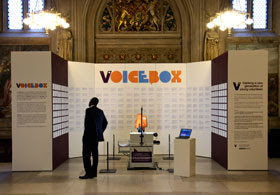 Young people can enter a Twitter-style 160 character message for MPs into a box on the central website http://voicebox.vinspired.com/our_robot. The robot, was positioned in parliament, and physically wrote out the best submissions, giving young people a direct link to MPs. Once the messages were written out by the robot, they were cut into neat postcards. Some 15,000 then lined the walls of the exhibition in Parliament and each message was photographed and uploaded onto Flickr, and was incorporated into a tag cloud for people to search.